Query Criteria, Part 1: Be specific! 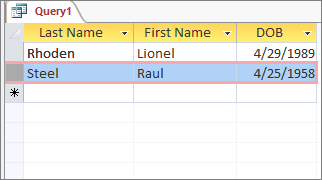 This is part 1 of a 3-part series about using criteria in queries. 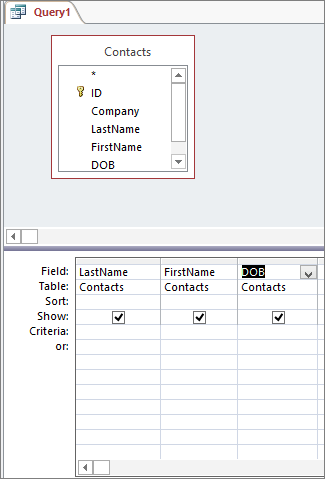 Queries are a fundamental part of developing and using any database. In addition to providing a way to make bulk changes to your data, they are how you ask questions about that data. 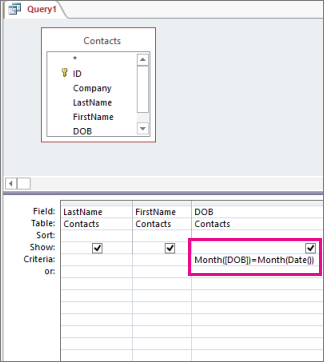 Query criteria help you make your question more specific – so instead of asking "What are my contacts' birthdays?" you could ask "Whose birthdays are coming up next month?" Very basic stuff. In this particular example, I don't have a huge list to look at, but imagine if I had hundreds of contacts. I probably wouldn't be interested in looking up all their birthdays very often. Now let's see how I could use a criterion to ask the more useful question: whose birthdays are this month? 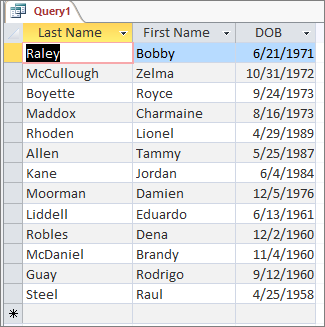 You can read more about how query criteria work and get a comprehensive set of examples in the article Examples of query criteria. Next up: In part 2 of this 3-part series, learn about using the LIKE operator and wildcard characters as criteria.